Increases Flexibility: Yoga helps to increase the flexibility of our muscles and tendons while reducing the risk of injury. Increases Strength & Vitality: Most forms of yoga help strengthen and tone muscles, while some of the more vigorous forms of yoga promote strength, flexibility, and relaxation. Strengthens the Immune System: Yoga stimulates the 4 physiological systems linked to immunity: circulatory, digestive, nervous, and endocrine. Each pose is devised to connect to at least one system that helps boost immunity. Improve Circulation: Yoga encourages good blood circulation which helps the body carry oxygen and valuable nutrients to the muscles, brain, and organs so they can function properly. Improve Muscle Balance: Many people who practice Yoga for the first time notice that some of their muscles become more flexible than others. 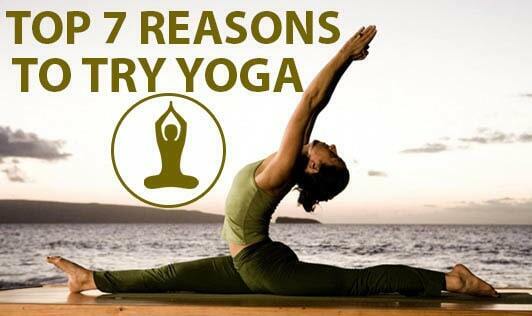 This is because yoga strengthens the weaker muscles and lengthens the tighter muscles. Reduces Stress & Anxiety: Yoga helps calm the mind and lowers stress levels by improving focus and concentration during meditation. Moreover, it also helps build inner strength to help cope with stress. Improves Posture: Yoga helps build strength in the deep core muscles and strengthens muscles of the upper back and lower back, which are all important to maintain good posture. So, go on and give Yoga a try!